Composer-performer collaborations can yield unique results from the synergy both parties bring, becoming testing grounds for the exploration of instrumental techniques, novel notation approaches and virtuosity in performance. In Tura New Music’s 2016 Scale Variable series, Soundstorm’s The Calm Before focused on this type of collaboration, presenting solo works by Perth-based composers Dominik Karski, Dobromila Jaskot and Pedro Alvarez. The title of the concert alludes to the cast of musicians (Soundstorm) but also evokes a mutable character in the music. 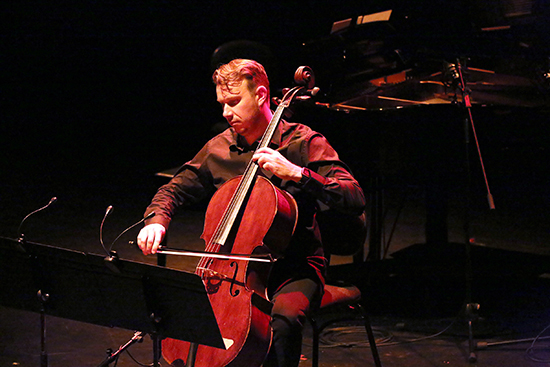 A rendition of Okanagon by Italian composer Giacinto Scelsi (1905-88) brought together the many strands of the concert with a focus on timbre and reference to non-Western traditions. Jim Coyle in his overview of Australian music for the double bass, describes Dominik Karski’s Along the edge of darkness (1999) as “the most advanced contrabass piece by an Australian composer in the twentieth century.” Performed by its dedicatee Joan Wright, the work employs scordatura, circular bowing, harmonics and glissandi, while the amplification colours the sound of the instrument to bring out its most minute details. The double bass is stripped of any tradition and becomes instead a sound object for physical expression. Wright raps on its body and rattles the strings, all the while maintaining multiple layers of dynamics and articulations. The piece never quite settles into a single direction but presents sounds in a state of flux, with their transitions demarcated by the performer’s movements. Pedro Alvarez’ De mares imaginados (2009) approaches instrumental exploration more lyrically, using pitch to construct sinuous and volatile lines separated by long pauses that accrue in tension as the piece progresses. 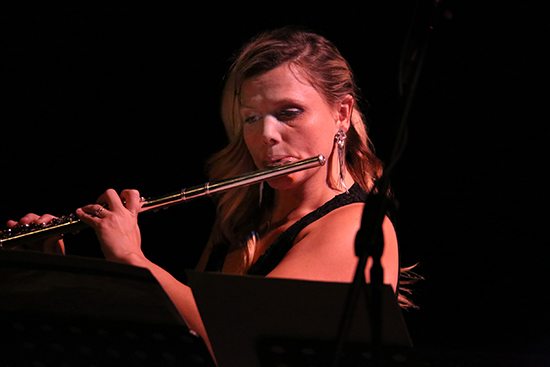 Flautist Kirsten Smith gives unity of mood to seemingly broken motifs, and the way she holds the work’s silences serves to amplify their inwardness. The tightly constructed themes assert their own context and are unbound by what comes before or after. Alvarez’ treatment of the material is akin to sculpting, with shifts in perspective that offer new insights into the composition’s elusive core. Contrasting with the preceding works, Dobromila Jaskot’s hanna (2009) extended the cello with live processing, a backing track and four speakers. The title is the scientific name for the King Cobra snake whose growling hiss is referenced throughout. Tristen Parr negotiates the hectic counterpoint between the electronics and his instrument, sometimes dodging and sometimes falling prey to the aggressive interjections of the backing track. The work seems to enact a viper’s sallies and recoils with deftly spatialised sounds moving across the venue. The second half of the concert begins with Jaskot’s Atnongara (2002), an extended solo piano piece performed by the composer herself. The title refers to crystalline stones used in Aboriginal shamanism, their possession giving virtue and mystic power to the one who carries them. The work features relentless figuration, conjuring up eddies and ripples within a revolving stream of high notes. Jaskot proves to be an arresting performer, swaying with eyes closed and instilling the pianistic gesture with flair. There was something of the Romantic tradition in the broadly orchestrated passages, yet the harmony remained static, as if exploring a single idea through a wide scope. Dominik Karski’s Streamworks (2003) belongs to a series of works that focus on the physicality of producing sounds, the material stemming from close collaboration with the player who explores the ergonomic properties of the instrument. Performed by Kirsten Smith on bass flute, the piece starts with a restless flow of keys clicking and sinewy lines from which breaths, pitch inflexions and different attacks emerge. Smith’s embrace of sounds normally avoided in traditional performance has a keen compositional sense, serving to emphasise the corporeal character of Karski’s music. Since the renaissance of his work in the 1980s, Italian composer Giacinto Scelsi has become a father figure for musicians working with texture. 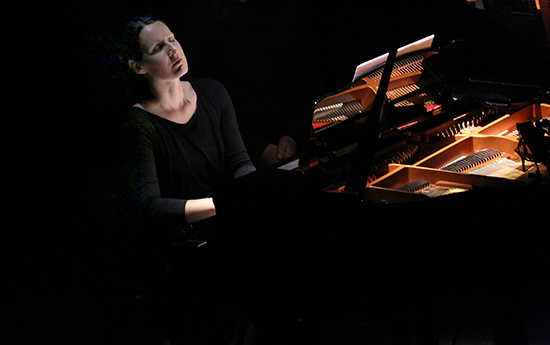 His focus on timbre, or what Tristan Murail describes as “the exploration of the interior of sounds,” is well manifested in Okanagon, the concert’s closing work, featuring Catherine Ashley on harp, Joan Wright on double bass and Louise Devenish on tam tam and with Pedro Alvarez conducting. Okanagon begins with an incantatory pulse representing the “heartbeat” of the earth. The musicians play in unison to create a fused tone, its microtonal progression later interrupted by percussive, tabla-like patterns. Wright assumed an intermediary role between the harp and the tam-tam parts, adding fluid microtonal lines that turned sound into a pliable material. The Calm Before was successful in presenting adventurous music that not only showcased the uniqueness of each composer but also the identity of the musicians. The introductory speech by concert curator Dominik Karski conveyed enthusiasm for works exploring formal concerns but also an intuitive and unselfconscious approach to music-making.